In my experience, people’s approach to daily Bible reading and prayer is quite a personal thing. Some folk prefer to use daily Bible reading notes, and happily use the same notes year after year. Others chop and change for variety, or to find notes that suit them. In the mornings, I’ve found the Good Book Company’s new ‘God’s Word for You’ series very helpful. I’ve used all three titles so far - Galatians for You, Judges for You and Romans 1-7 for You and plan to read more as they come out. The series is triple-barrelled: they are for us to Read, Feed and Lead. Each chapter of the book of the Bible being studied – in this review, Romans – is covered by one chapter in the study book, and is split into two parts. I’ve found one ‘Part’ an ideal length to read for one day’s Bible reading. Be advised that sometimes Part 1 and Part 2 cover different verses from the set chapter, at other times, each Part considers the whole chapter, but from two different angles. Tim Keller really gets to the heart of a passage, sometimes briefly sketching an alternative view, but explaining why he takes the view he does, and is particularly sure-footed in applying the passage (some study guides make an application that doesn’t seem to follow from the verses in question). Also, the ‘Questions for Reflection’ at the end of each Part are better than average, very searching, and really make you think about what God is saying to you through His Word. There is also a helpful Glossary at the back explaining more difficult words (these are put in bold in the text of the book), and very useful appendices giving a summary of Romans 1-7; help on identifying the idols of the heart (very challenging! ); and evaluating recent views of justification that fall short of the full-blooded biblical teaching. 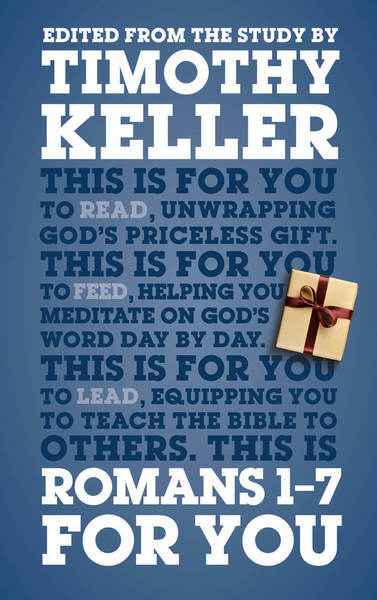 All this makes the book ideal to Read as a book; to be used as fuel to Feed your heart and mind during personal devotions; or as a resource to help you prepare to Lead your small group or congregation. The book (and series) is remarkable in achieving all three aims in a relatively short compass and in accessible text. I’m looking forward to future volumes! - and the books would also make excellent gifts to a wide variety of people.